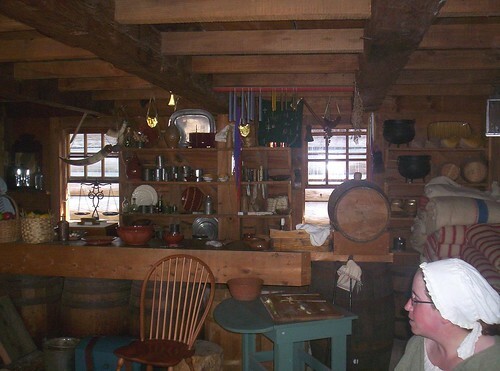 Well, we have been to Fort Stanwix about four times total. We love it. 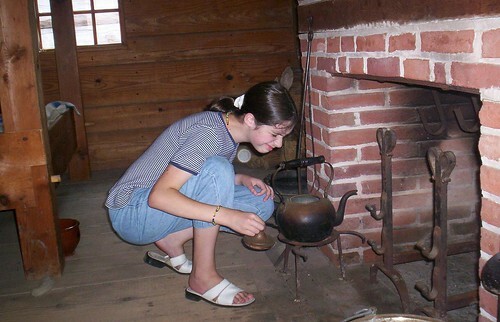 Admission is free, and it is a terrific place to learn about Revolutionary history. Last time we visited, in August 2005, they had just completed the Marinus Willett Center, which is a combination museum and audio-visual complex. We watched a superb movie about the important role the Oneida Indians played in our quest for Independence. 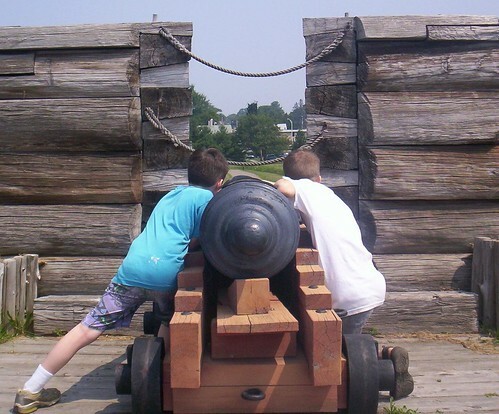 Anyway, Fort Stanwix is an absolutely great place to take the kids. Here are some photos; after these, my daughter The Historian has written a brief history of the Fort and its importance today. We entered the fort over a drawbridge. There is a deep trench that surrounds the fort, to ward off invaders. Big meaty wooden spikes growl out from the sides of the palisade, threatening those who dare try to climb over the walls. So… since the door was open anyway, we decided to skip our planned invasion and just walk right in. Inside the fort is a wide open square. We were free to roam the grounds and fort. The actors, all dressed accordingly and wandering the fort freely to answer questions by curious tourists, assembled together for a display of American musketry. The guys were really great; they answered questions, were friendly and jovial, and they let us look at the weapons!!!! Here’s a neat shot of the view– the Rome skyline from the top of the fort. 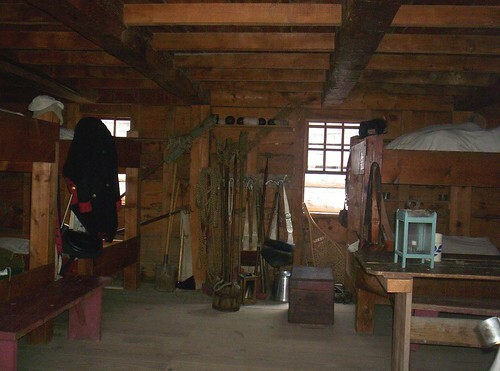 The Soldiers’ Bunk Room was filled with neat stuff- cannon balls of various weights, guns, sacks, clothing, ropes, barrels, and rope bunks with straw mattresses. 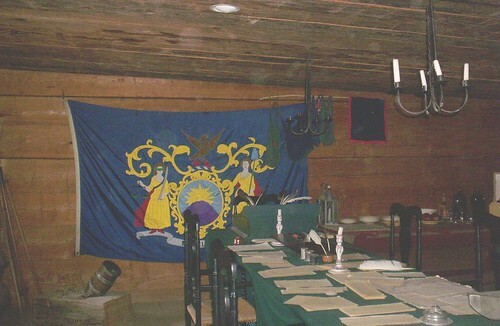 The flag hanging on the wall belonged to the regiment stationed at Fort Stanwix. The images of Liberty and Justice were later the basis for New York’s state flag. It is said that Fort Stanwix in Rome, NY, was the first place to hang the Stars and Stripes flag of the United States of America. 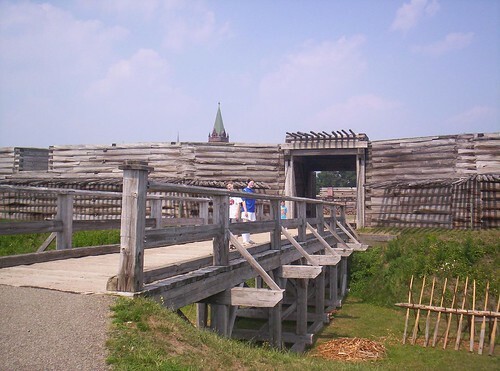 Fort Stanwix is a restored fort in Rome, NY, that is one of the most memorable and significant historical landmarks of the Mohawk Valley and Oneida County, where my family lives. The history of this fort dates all the way back to the French and Indian War, when General John Stanwix, a British officer, erected it in 1758. The original purpose of this fort was to guard the Oneida Carrying Place at the westernmost tip of the Mohawk River, which branches off from the Hudson, and thereby protect the trade of the New York colonists. After the French and Indian War, however, the fort was virtually abandoned, and allowed to deteriorate. 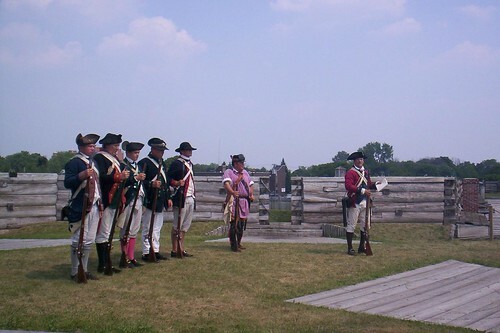 Thankfully, in the year 1776, when the colonists were at war with Great Britain, General George Washington ordered that the fort be rebuilt and reoccupied by American Continental troops, and it was then that it was named Fort Schuyler, in honor of the Head of the Northern Department, and head of the Continental military forces in New York, Major-General Philip Schuyler. This move of Washington proved to be a very shrewd move, because the next year, 1777, British General “Gentleman Johnny” Burgoyne launched his infamous “three-pronged” attack on the state of New York. This attack would consist of three British forces coming from the North, South, and West directions of the State and meet at Albany – hopefully – at about the same time. The west prong of the attack, headed by General Barry St. Ledger and several thousand savage Iroquois Indians, mostly Mohawks, were to march directly through the Mohawk Valley, and terrorize the colonists on their way to meet Burgoyne, leading the northern prong, at Albany. The reason that General Burgoyne called for British forces to move through the Mohawk Valley region of Upstate New York was because the Valley was widely known as the “Breadbasket of the American Revolution,” due to the fact that this valley provided Washington and his troops with a great supply of bread, corn and many other vital supplies. Burgoyne figured that if the Valley could be taken into British hands, then he could starve Washington’s army into surrender and quickly end the war. St. Ledger’s force was successfully kept back from fully accomplishing its purpose, however, because Fort Stanwix, fortified with guns, men, artillery, and the staunch commanders Colonel Peter Gansevoort and Lieutenant-Colonel Marinus Willett, stood smack-dab in the way of the advancing British troops! 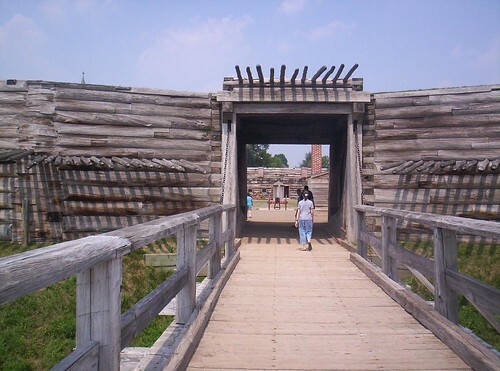 The British lay siege to the fort and held it up until Fort Stanwix, running out of food and supplies, sent for help. The American relief force was ambushed on the way in the commemorated Battle of Oriskany, and therefore it never reached Fort Stanwix, but this battle did accomplish two purposes: (1) It fatally wounded the morale of the Iroquois tribes that had sided with the British (the Oneidas and the Tuscaroras sided with the American colonists), because the Battle of Oriskany, the bloodiest of the whole War, had brought them in to conflict with their own nation; (2) because the Iroquois, who had made up the majority of St. Ledger’s force, were demoralized and deserted, the British General, who had heavily relied upon their vast knowledge of the land and successful espionage, was forced to turn back and give up the siege. 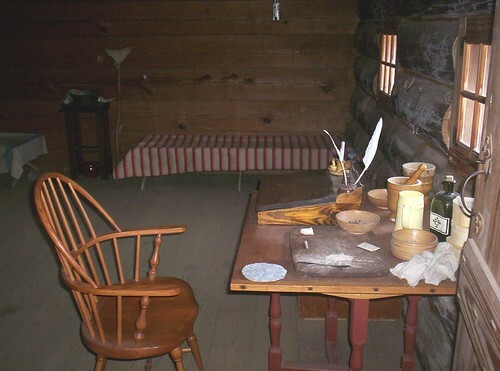 Thus, Fort Stanwix prevented Ledger from wiping out the patriot forces in the Mohawk Valley, and therefore left Burgoyne to face the 20,000 patriot army with his smaller army, inexperienced in wilderness warfare, alone, thus securing an American victory at Saratoga. This victory kept New York in American hands, and kept the British from the dividing New England, the Hotbed of the Revolution, with the Mid- and Southern States, where the Continental Congress and General Washington’s forces were stationed. This ultimately secured the victory of the Americans in the War for Independence, and that is why Upstate New Yorkers proudly point to Fort Stanwix with great pride. This pride is evident in almost every way of civic life in Oneida County. 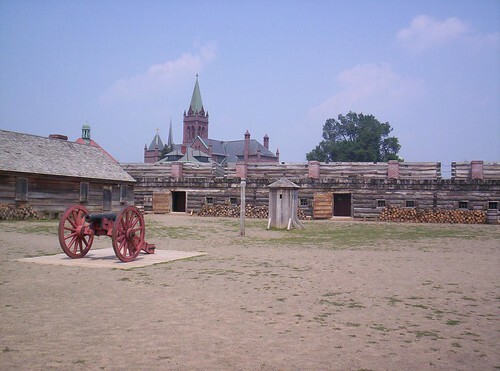 In the 1970s, restoration of the fort began, and now it is known as the Fort Stanwix National Historic Monument. Admission is free, and the Revolutionary world comes to life as you travel through the rooms and tunnels and bastions of the fort. My family and I have visited this site many times, and we have loved every minute of it!